DELPHI, Ind. -- There's been a break in the killings of two girls in Delphi. Investigators with the Indiana State Police released a composite sketch Monday of the suspect believed to be involved murders of Abby Williams and Liberty German back in February. The composite sketch was created after state police received new information, sources tell Call 6 Investigates. The suspect is described as a white man between 5-foot-6 and 5-foot-10, weighing 180-220 pounds, with reddish brown hair, and unknown eye color. The hat the man is wearing in the sketch may not be accurate. "We feel this is very important because it actually gives a better view of the person shown [in the previous photos]." Indiana State Police Sgt. Kim Riley said. "It gives you a little more facial features. It gives you a little more information on what you're looking at, who the suspect might be. ... We feel that it is the same person." Riley said investigators are still getting 5-10 tips per day. "This case is not dried up," Riley said. "It's not a cold case. This case is still very active." 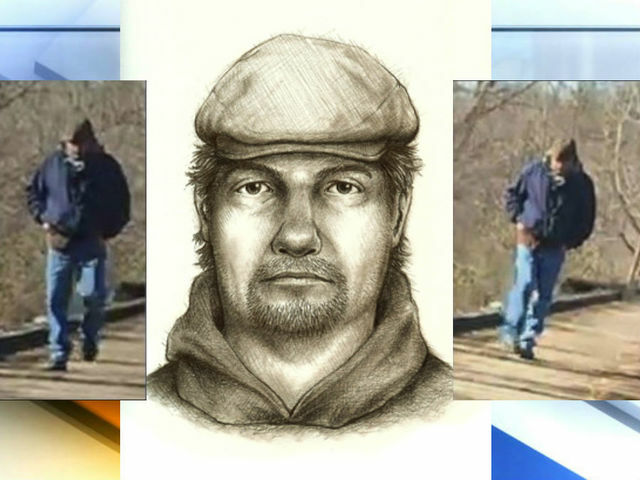 State police believe this new sketch may help identify a man who appeared in two previously released photos that were taken on the Monon High Bridge in Delphi, Indiana on February 13 when Abby and Libby disappeared. Their bodies were found the next day. Mike Patty, Libby's grandfather, said, "Please spread the information," when he heard about the sketch being released. In addition to the sketch and photos of the suspect, police had previously released audio which was taken by Liberty on her cell phone. You can hear a man's voice saying "down the hill" during what police call "criminal activity." You can listen to that recording below. Investigators have received over 18,000 tips and interviewed over 1,000 potential suspects. More than 20 people have been arrested on unrelated charges because of the case, but so far no one has been charged with Libby and Abby's murders. The reward for information leading to the arrest of their killer has grown to over $230,000 since February. Indiana State Police ask anyone who recognizes the man from the sketch, photos, or the voice, to call the tip line at (844) 459-5786 or 1-800-225-5324 (800-Call-FBI). Tips can also be emailed to Abbyandlibbytip@cacoshrf.com. Information can be reported anonymously.